The U.S. and El Salvador are both my home. The U.S. is my home, but at the same time it isn’t. It is my home in that it’s where I grew up. It is where I became who I am right now, and it’ll continue to shape me and my future. But, I don’t have all of my family growing up around me. For that reason, when asked where I’m from, the answer will always be El Salvador. I have family living here in the U.S. and that makes it home. I have family living in El Salvador and that makes it home. I’ve read stories about people deported back to El Salvador, but they have not been welcomed with open arms. To be rejected like that from your country of origin is heartbreaking. I know that I cannot obtain the future I dream of in El Salvador. Both these places are home, but the U.S. is the only place for me to grow economically, socially, and academically. When we left El Salvador, we left a lot behind. My mom owned a beautiful store, stocked high with a wide variety of foods. She gave it to my grandmother. We were building a house for my family — a home for me, my parents, and my sister. It wasn’t quite finished when we left. Now, another family lives in the house meant for us. We have family members whom I’ve never met. My dad left first, right after my first birthday. He didn’t get to see my sister, Monica, born. We left a lot behind. I always knew that I was undocumented — it was never really a secret in our family. My parents didn’t bring up our status publicly, and I’m glad. I think it would have made me more timid. I always played outside with other kids and didn’t worry about my status. I was very open about being undocumented, and I was never afraid to say that I was. It was never a secret between me and my friends.My parents warned me that, because of my status, I couldn’t do all of the things that I wanted to do but that reality didn’t sink in until high school. In 10th grade, I began researching college options for undocumented students. I learned that the Governor had signed legislation granting in-state tuition for undocumented students. That was the first glimmer of hope. Many of the scholarships I researched required applicants to be a U.S. citizen or a permanent resident. 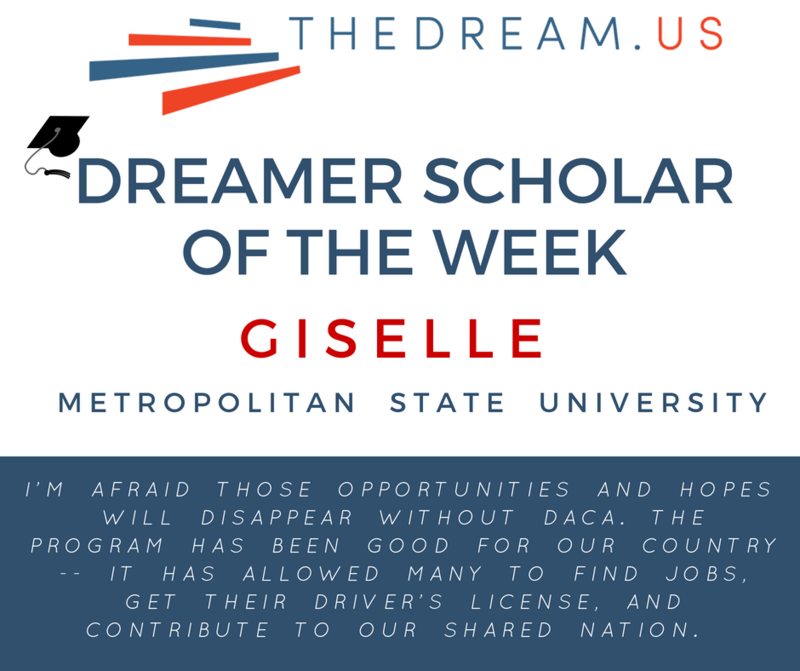 My hope and dreams grew when I found TheDream.US scholarship and the Hispanic Scholarship Fund. I haven’t yet declared my major at Metropolitan State, but I have an interest in Linguistics. My goal is to serve as a translator and provide comfort for people who don’t speak English. Recently, I’ve been helping our upstairs neighbors, who are struggling with their registration. In the future, I hope to return to my elementary school and help parents and students there. I don’t want to stop at a bachelor’s degree, but instead want to continue on to obtain my master’s and doctorate’s. I want to continue my education once I am financially stable.I’m afraid those opportunities and hopes will disappear without DACA. The program has been good for our country — it has allowed many to find jobs, get their driver’s license, and contribute to our shared nation. People need to be able to work, to go to school, and to improve their families’ lives. The DACA program also helps psychologically — it reduced DREAMers’ anxieties and allows us to pursue our dreams uninhibited.